Caffè Nero has joined the growing list of tax dodgers, which includes Starbucks. Coffee shop chain Caffè Nero paid no corporation tax in the UK last year, despite ringing up profits of £25.5m. Companies House filings show turnover at Caffè Nero grew 6.7 per cent to £257.6m as it opened 31 stores over the year. Caffè Nero has not paid UK corporation tax since 2007 and came under criticism last year for not paying corporation tax in 2015 on profits of £23.6m. Starbucks has also faced backlash in the past over alleged tax avoidance, but has since changed the structure of its company and paid an £8.1m UK corporation tax bill in 2015. It is unfortunate Caffè Nero now own Harris + Hoole – Tolley, Tolley and Tolley having sold the staff down the river. They did the same to Taylor St Barista staff when they closed the coffee shop in Brighton. In both cases, these excellent coffee shops, especially Taylor St Barista in Brighton and Harris + Hoole in Guildford, could have been made available to their staff and customers to run as open coops, but that would not have satisfied the greed of Tolley, Tolley and Tolley. The solution is simple, avoid disgusting coffee in Costa, tax dodging Starbucks and Caffè Nero and support local indie coffee shops. Those who support the EU, why do they continue to turn a blind eye to Greece? Greece dared stand up and challenge the EU, for that Greece had to be destroyed. The main route for destroying Greece was to destroy the Greek banks. That action may have been illegal. Former Greek Finance Minister Yanis Varoufakis and Fabio de Masi MEP, together with a broad alliance of politicians and academics (below), have announced they will file a mass freedom of information request to the ECB to uncover #TheGreekFiles once and for all. Please support their request to release these critical documents by signing the petition calling for the release of #The GreekFiles. This DiEM25 petition is supported by a coalition of politicians and academics, with divergent views on the future of the EU and the Eurozone. In June 2015, the newly-elected Greek government was locked in tense negotiations with its creditors (the ‘Troika’ – the ECB, EC and IMF), doing what it had been voted in to do: renegotiate the country’s public debt, fiscal policy and reform agenda, and save its people from the hardship of the most crushing austerity programme in modern history. The Troika knew they needed to make a drastic move to force the Greek government to capitulate. And that’s just what they did: through the ECB, they took action to force Greece’s banks to close, ultimately driving the Greek government – against its democratic mandate – to accept the country’s third ‘bailout’, together with new austerity measures and new reductions in national sovereignty. But in their haste, their zeal to crush the Greek government’s resistance, the ECB feared their actions might be legally dubious. So they commissioned a private law firm to examine whether those decisions were legal. The legal opinion of this law firm is contained in #TheGreekFiles. In July 2015, the German MEP Fabio De Masi asked Mario Draghi to release the legal opinion. Mario refused, hiding behind ‘attorney-client privilege’. Clearly #TheGreekFiles contain something he doesn’t want us to see. One of the foremost experts on European Law, Professor Andreas Fischer-Lescano, examined whether the ECB was right to refuse to release #TheGreekFiles. His detailed conclusion leaves no room for doubt: the ECB has no case for withholding from MEPs and the citizens of Europe the legal opinion the ECB secured (and paid for using your money) regarding its own conduct. But in addition to the legal imperative: in today’s Eurozone, the power of the ECB to close down a member-state’s banks violates every democratic principle. It also violates the ECB’s own aspiration, and charter obligation, to be independent and above political strategising. We must all throw light on the lawfulness and propriety of ECB decision-making – beginning with this case – to give European democracy a chance, as well as to make the ECB less vulnerable to power politics. I walked up Steep Hill, then on the way back down, cappuccino at Makushi. Today different beans, today from Honduras. A cappuccino and latte plus a cookie at Stokes on High Bridge. Cookie was excellent, but mixed feelings about the coffee. We have third coffee wave, little indie coffee shops, small indie coffee roasters, coffee plantations, all working together to bring you the best in a cup of coffee. The roasters go to the plantation, to ensure the best growing conditions, the best beans are then picked. Next stage is how the beans are extracted and washed. The coffee roaster attempt to bring out the best character of the beans. Finally the barista coaxes the best the beans can offer. Get any part of the chain wrong, and you will have poor quality coffee. Stokes, instead of moving forward embracing this third wave, are not standing still, they are regressing. A latte should look good, that is why it is served in glass. In Stokes, up until a couple of weeks ago, served an excellent latte, not any more. A barista will take pride, not only in how the cappuccino is brewed but also in the art. This used to be true of Stokes, not any more. What is going wrong? Nothing like asking. Orders from head office. We have to serve the classic Italian cappuccino. Repeated like an automaton with no great faith in what they were saying. No, Italy does not serve great coffee. This is to go backwards. It is a myth Italy is associated with good coffee. That myth has arisen because the Italians invented the espresso machine, though the French may beg to differ. The myth that Italy is synonomous with quality coffee, is just that, a myth. Italy invented the espresso machine, though the French may wish to dispute this. It was the French who first applied steam to drive water under pressure through coffee. In 1818, Mr Laurens of Paris used a percolator system to create coffee. Further refinements by Louis Bernard Rabaut in 1822. It was not until the early 1900s Italians came on the scene. 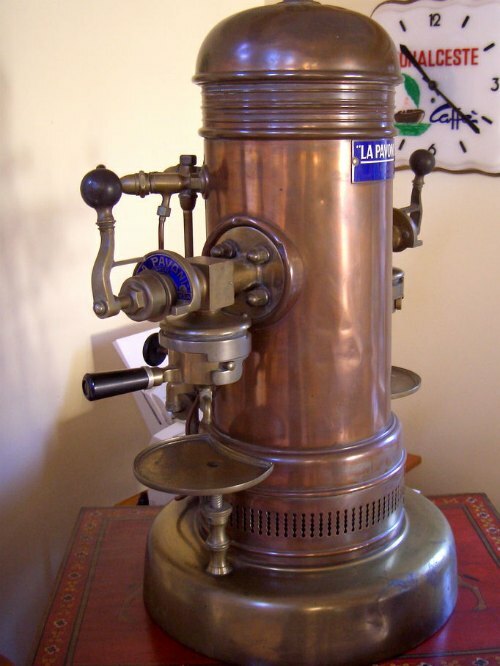 In 1901, Luigi Bezzera created a primitive espresso machine. It was not until post-WWII we had the forerunner of the modern espresso machine. It was Italian Fascists who coined the term barista, to differentiate from the American barman. The world has moved on from bad Italian coffee, leave that to the likes of Costa, with their over roasted coffee. And speaking of Costa. Stokes has appointed a training manager, from er, Costa! Stokes is a very old coffee business, dating from 1902, now a fourth generation family business. The current location of Stokes on High Bridge, in a Tudor building on a Norman Bridge over the River Witham dates from 1937. Stokes have recently acquired The Lawn, though begs the question when will it open? It will serve coffee, roast coffee, run coffee classes. Though why has the Joseph Banks Conservatory been relocated? A key feature of The Lawn. The service of late in Stokes on High Bridge has been abyssal. Today service was much improved. The River Witham, which runs beneath Stokes, was today running very fast and very muddy. From Waterstone’s, four copies of The Spy. Strictly speaking, swapped four copies. Waterstone’s stick stickers on the front of their books, which damage the books. Outside Waterstone’s, between Stokes and The Stonebow, a man was playing a saxophone. He was quite good, but why oh why ghastly backing music? It would have been far better, a sax on its own. A little further up the High Street, Richard Silvester playing violin. I suggested he recorded and released on bandcamp. He asked what would did I like? Paganini. A parcel delivered to the wrong address whilst out, delivered to a neighbour. Though to say ‘delivered’ is to stretch the meaning of the word. Dumped by the bins in the wet. Yesterday the lower half of the top of the High Street, a pedestrianised street, a Hermes driver obviously thought it ok to drive through with hazard lights flashing. Lunch at Butcher and Beast in Heighington. Butcher and Beast is an old pub, built of local stone, located in the village of Heighington. As you walk in, you are greeted by an open fire, a small bar. The fire welcome on a cold day, only problem, a blast of cold air, every time the front door opens. The last time I ate here, a year ago, the food was not good. Had it improved? In the past have gone into a back room, where it was very cold. Today, in the front parlour where it was bright and sunny. The back room was very dark. Later joined by a friendly dog. Soup was carrot and coriander, served with a bread roll and butter. Not a great favourite. It was served lukewarm. Not a great start. Crispy prawns with salad and sweet chili dip were excellent. And served piping hot. The gammon steak, served with chips and peas and a slice of pineapple was also excellent, though one of the gammon steaks was of a poor quality cut. The chips were fresh. For a tiny pub, with a very tiny bar, a surprising wide choice of real ales. A Bateman tied pub, therefore most were sourced from Bateman. I chose one which I think was called Taylor’s Landlord. The barman, did not know how to serve. Very cloudy, but soon settled down laving a beautiful amber colour. Heighington is a Lincolnshire village of stone cottages, not far from Lincoln. Its only tea shop closed a couple of years ago. The Post Office has also closed. There is now a tiny Post Office counter in the local Spar shop. Also hidden at the back of the Spar shop is the local butcher, one of the best in the country. It is worth a visit, for his Lincolnshire sausages. When is a pedestrianised street not a pedestrianised street? It is a reasonable assumption, that a pedestrianised street is a pedestrianised street, a safe area for pedestrians to stroll, free of cars, vans and lorries. Not in the centre of Lincoln. In the city centre, a pedestrianised area, where cars, vans and lorries drive through up until ten o’clock in the morning. That is the permitted time, they actually continue to drive through until at least 10-30. Then a repeat after four o’clock. Today the High Street was packed, and yet vans and lorries were driving through. A lorry drove through, then turned right before the Stonebow. Maybe the driver thought it ok, because he had his hazard lights flashing. Legally he could drive through as it was after four o’clock. But earlier, a car was driving up past The Stonebow up the High Street. Maybe the driver thought it was ok because he was serf working for Hermes at less than the minimum wage and was delivering a parcel. Or maybe he thought it was ok because he or she had their hazard lights flashing. Coffee Aroma have been ordered to remove their tables and chairs by four o’clock in the afternoon. And yet they are not the problem. The problems is crass planning policies that permit cars, vans and lorries to drive through pedestrianised streets. The week before, as I walked past Coffee Aroma at four o’clock with their tables and chairs stacked up, I was nearly run down by a white van. Across Europe pedestrianised areas, vans and lorries park on the outskirts and deliver by handcart and trolley. It would be safer for pedestrians, minimise damage to the street surface, and improve the air quality with no diesel engines belching out their toxic fumes. Tags:Lincoln, pedestrianised streets, When is a pedestrianised street not a pedestrianised street? A pleasant sunny day, though very cold in the shade with a bitter cold wind blowing. I decided, walk up Steep Hill to the top, then if I had time, a cappuccino in Makushi on the way back down. Steep Hill surprisingly very busy, as was the High Street. It was like Christmas and New Year. I assume because school half term. Makushi though was surprisingly not busy. I sat by the window. It often works, people do not go in a place that looks empty. And yes it did work, a steady stream of customers. My cappuccino was excellent, but and a curious but. In many ways a perfect cappuccino, only had like this in Coffee Lab and a couple of other places, but, and it has been three times now, an excellent cappuccino, but always a strange taste within the cappuccino. Why I do not not know. The Little Bicycle Coffee Shop down in the town has exactly the same coffee beans, roasted the same way, and yet never has this strange taste. And last week, following my suggestion, the cappuccino was better, though Makushi even better but for the strange taste. At the back of Makushi, in a back room, there is an undercroft. It has always been occupied when I have visited previously. I guess if you know it is there, a good place to sit, and not everyday can have a coffee in an undercroft. But, luckily for me, today not occupied. A long table down the middle, coffee books and coffee mags on a shelf at the back, and as I walked in a bookcase of books. Whether can take the books or for show I do not know, as I did not ask, but they looked as though there for people to read. Maybe they ought set up as a BookCrossing zone. Walking back down very cold. A car decided ok to drive through the lower half of top end of High Street cos I am a Hermes driver delivering. No, it is not ok, and your are a mug working for Hermes. But, in the High Street there is a problem. A pedestrianised street and yet after four o’clock lorries allowed to drive through. After four o’clock the High Street was packed and yet vans and lorries are allowed to drive through. Coffee Aroma has been ordered to remove its tables and chairs by four o’clock. Who is causing the problem and a danger to the public, Coffee Aroma or Lincoln City Council and Lincolnshire County Council, with bad town centre planning and allowing cars, vans and lorries through the city centre? Last week, I was almost run down at four o’clock by a white van as I walked by Coffee Aroma with their tables and chairs neatly stacked up. I thought today I would continue trying different coffee shops, always a risky venture, as never know what will be served. I was going to try Cafe W, the new coffee shop in Waterstone’s, which I have yet to try. They kicked out Costa which was a smart move. Then I thought, no, I will walk up to Makushi half way up Steep Hill. I stopped for a chat at The Little Bicycle Coffee Shop, and that was as far as I got. It was though, a good move, I had an excellent cappuccino. I asked that it be made differently. Instead of one shot, I had two shots. My first sip, maybe too strong. I was wrong, it was perfect. Prices too have now improved. £2-80 a cappuccino was too high for a stall, pushing it for a coffee shop. Now £2-60. Better. A chat with a few of the customers. They were very impressed with their coffee. The Little Coffee Shop source their roasted beans from Makushi, which are also on sale. A quick visit to the market and Sincil Street, then a look in Waterstone’s. An illustrated Alice on display. As I walked past Stokes on High Bridge on the dot of four o’clock, I notice literally empty, not a single person enjoying a tea or a coffee. Coffee Aroma had their tables and chairs stacked up. By edict of Lincolnshire County Council. The problem is not Coffee Aroma with tables and chairs outside their coffee shop. The problem is traffic allowed in a pedestrianised street. It is time to consider the launch of an indie coffee shop chain disrupter loyalty card. A bit of a mouthful, though the concept is simple enough. Quality indie coffee shops, for example Stokes, Coffee Aroma, Makushi, The Little Bicycle Coffee Shop, launch a joint loyalty card. To have a free coffee, would have to show had been stamped by at least three of the participants, and would be taken at one of the coffee shops where stamped. New participants could join the scheme, but they would have to be approved, show they source quality beans, traceable to the finca or farm, had skilled baristas who take a pride and were knowledgeable on the coffee they served. The card itself could be a collectors item, featuring on one side an illustration or quote related to Lincoln. Each new card, a local artist or designer. Sharing, collaborative commons, they would not be paid, but would be entitled to free coffee at any of the participants for the duration of the card. You are currently browsing the Keithpp's Blog blog archives for February, 2017.